Infusions. They’re not just for spirits. Thanks to the mad scientists at Dogfish Head Brewery, we can put fresh or dry ingredients into something they developed called a “Randall” and then run beer through it. It’s like rocket science, but better, because beer. Tasty. Our first recipe starts with the smoke Cherrywood notes of Tangled Roots Brewing Company’s American Stout. Then, we’ll run it through strawberries and vanilla bean. These sweet notes will add a light, fruity essence to the base beer’s roasted malty goodness. For bolder palates, you won’t be disappointed by this recipe featuring Soundgrowler Brewing Co.’s Lysergic Funeral Black IPA. Beyond its infinitely metal name, it has what the creators call a “pungent” dry hop flavor within a very dark malt. We’ll double down on the hops by filling the Randall with fresh hops, and then we’ll kick you with some jalapeno. It’s basically a hop bomb exploding directly in your mouth. Brutal. If you are looking for big flavor with less earthiness, try this sweeter concoction we’re infusing. We’ll mix cocoa nibs with deliciously light coconut, with a dash of peppermint for a little twist. This will sit in Noon Whistle Brewing’s Bernie Milk Stout, bringing its own sugariness and warm chocolate notes. It’s a drinkable dessert you’ll want – no, need – to save room for. What would the infusion tent be without some love for Two Brothers Brewery? We have a feeling their Twenty-Plus Pilsner’s black pepper, herbal, and floral notes will be complemented perfectly with a tropical and earthy infusion of citrus and sage. The citrus will bring out the sweetness of the original brew, with fragrant sage bringing a clean finish to an already hoppy deliciousness. We’re looking forward to warming you up with these twists on already-crazy-good beers from local breweries, because two brewing brains are better than one. Trust us, there’s no better way to celebrate the base recipe by complementing it with fresh infusions. Or don’t trust us, and visit the Infusion Tent to see for yourself. 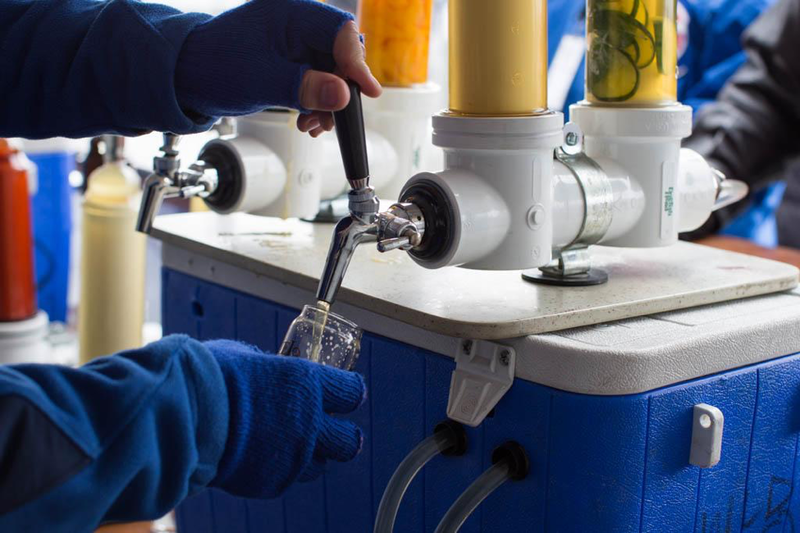 The 2018 Naperville Ale Fest – Winter Edition will take place on Saturday, February 24 from 12pm-4pm. Situated on the frozen tundra of Naperville’s Frontier Park – the fest will feature over 150 unique American craft beers. Pull out your long-johns and parkas, it’s time to experience winter’s best craft beers. The fest will also feature food from some of Chicagoland’s favorite food trucks.